2018 BMW R nineT Urban GS X. Picture credits - BMW. Submit more pictures. The design of the R nineT Urban G/S is eye-catching. Distinctive stylistic elements make it a powerful, robust bike that pays tribute to the original G/S design: the 19-inch front wheel, the telescopic fork with the familiar bellows, the headlamp mask with the windscreen and the raised mudguard define the front of the bike. Its profile is defined by a pronounced horizontal lines. Ask questions Join the 18 BMW R nineT Urban GS X discussion group or the general BMW discussion group. Get a list of related motorbikes before you buy this BMW. Inspect technical data. Look at photos. Read the riders' comments at the bike's discussion group. And check out the bike's reliability, repair costs, etc. 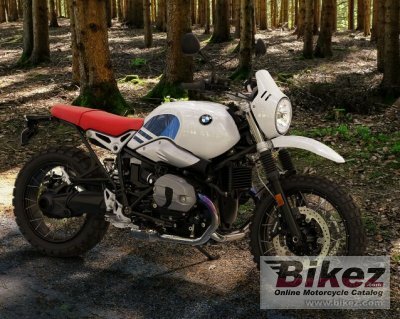 Show any 2018 BMW R nineT Urban GS X for sale on our Bikez.biz Motorcycle Classifieds. You can also sign up for e-mail notification when such bikes are advertised in the future. And advertise your old MC for sale. Our efficient ads are free. You are also welcome to read and submit motorcycle reviews.